With the Sixers facing the Atlanta Hawks tonight, I chatted with Brad Rowland to learn more about one of the league’s youngest teams. In addition to his Hawks coverage for PeachtreeHoops.com, he hosts the Locked on Hawks Podcast. 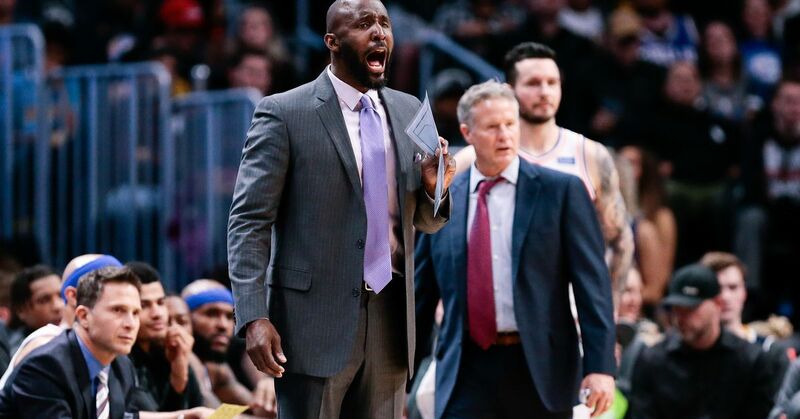 Question #1: The Sixers lost an underrated piece of the puzzle this summer when lead assistant coach Lloyd Pierce left for the head coaching position in Atlanta. How would you evaluate Pierce’s tenure thus far? I think, as with any first-year head coach, Pierce gets an “incomplete” so far- but it’s going well. He drew a ton of praise for his player development and defense-first background, and while the defense is going to take a while given Atlanta’s personnel issues, it is easy to see why everyone swears by Pierce. He’s polished, but in an engaging way, and Atlanta’s offensive profile (particularly regarding where and how they attempt shots) has been picture-perfect thus far. It would be easy to quibble with rotation stuff and other little things but, in an overall sense, Pierce has been as advertised and that’s a good thing. Question #2: Given the youth movement going on in Atlanta in addition to their poor standing in the Eastern Conference, it would be hard to imagine the Hawks not being sellers in the next month as we get closer to the Trade Deadline. Which players do you expect them to look at moving, and what kinds of returns will they be looking for? I recently had Hawks GM Travis Schlenk on my podcast and he essentially confirmed what you’re saying without explicitly saying it. Atlanta will certainly be taking calls on veterans and everything is viewed through the prism of the future. The obvious names are Kent Bazemore, Jeremy Lin and Dewayne Dedmon. Bazemore is complicated in that he has a (very) lucrative player option for next year, but he’s a starting-caliber wing and the Hawks would be willing to take on some bad money in an effort to land a future-facing asset. Lin and Dedmon aren’t as good as Bazemore but they’re both expiring contracts, which is always intriguing. At the moment, Lin is basically the best backup point guard in the league, but because the team is heavily invested in Trae Young, he doesn’t get on the floor as much as he probably should. The only hiccup there is that Lin is very well paid at this juncture, but he’d help a lot of teams. Dedmon is a low-end starter at center, especially with the way he’s pushed his game out to the three-point line offensively, and he makes only about $7 million, which could make him the easiest piece to move. The Hawks are going to want either young and cost-controlled players or draft picks in any deal, but Schlenk also noted with me that the team has a ton of 2019 draft assets, so they could be looking further down the line. Question #3: A common position when having a debate about the pros and cons of tanking the way the Sixers were doing a few years ago is that you will “lose the fans.” After many years of stability near the top of the East, how have Atlanta fans reacted to the Hawks rebuilding? As you might expect, the reaction has been mixed. Some fans lament every win and focus their attention on attracting Zion Williamson or whatever top prospect they’ve already fallen in love with during the college season. On the flip side, some really hated the decision to bottom out and there is the natural push-back to Atlanta’s elaborate rebuilding effort. The Hawks clearly aren’t very good but, in some ways, they’ve made some concessions to the anti-tanking crowd by acquiring reasonably effective veterans (Ilyasova and Dedmon last season, Lin this season) in an effort to avoid being abjectly disastrous. At the end of the day, it’s a philosophical choice but the Hawks have paid the price at the ticket office (not a strength previously, by any means) as a result. I think most fans, in my experience, at least understand the concept of what Atlanta is doing, but they don’t all like it, that’s for sure. Big thanks to Brad for taking the time to answer our Hawks questions!